What do all great business schools have in common? Well, a few things come to mind. First, they have a talented and dedicated faculty. Certainly, our faculty members meet that standard. Over and again, I am impressed by the ability, creativity, and hard work of our faculty. Second, they all have capable and motivated students. And, Georgia Southern students are certainly capable and motivated. Not a day goes by that I am not impressed in some way by our students. Another piece of the puzzle is an engaged and accomplished group of alumni and friends. Our alumni and friends are our connection to the business community. They serve as role models for our students and provide the resources that help us to recruit, support, and retain our faculty. They are an invaluable part of the equation, and they are essential to our reputation and future. Given that, I wanted to take a moment and thank two specific groups of alumni and friends. Specifically, I want to give a shout out to our Dean’s Advisory Board (DAB) and our Young Alumni Board (YAB). Both groups consist of accomplished men and women who love the College of Business at Georgia Southern. And, both groups met on campus last month. During our meetings, we discussed a range of things related to the College’s programs and initiatives. We got their input on how to better prepare our students and how to better engage their companies. We asked them to mentor our students and to speak in our classes. Members of our boards have sponsored our Eagle Executive Exchanges, and they have been instrumental in helping us to expand and engage our network of supporters. They open doors for us, and they provide wise counsel. They encourage our students, and they support our programs. And, perhaps most importantly, they do all of this on a volunteer basis, simply because they want to help, and they want to see the College of Business among the best in the world. So, I want to take this opportunity to thank them, and I want to encourage everyone to do the same. We’ll soon have both groups, along with our newly formed Student Advisory Board, listed on our website. So, you’ll be able to see who they are. These groups are key to our success, and I appreciate them tremendously. So, here’s a shout out to the College of Business DAB and YAB. You all represent the very best of Georgia Southern. I am proud to be associated with you and proud to count you among the friends of the College of Business! On Tuesday, October 28, the Logistics Association of Georgia Southern and logistics faculty hosted 231 students and 63 industry representatives during the Fall 2014 Logistics Roundtable. Support from 23 different firms including major retailers, product distributors, motor carriers, railroads, and third-party logistics (3PL) providers offered students an invaluable opportunity to explore logistics-related career possibilities via interactive panels and networking sessions with current industry professionals. Industry professionals included recent alumni as well as experienced executives, who shared a variety of real-world experiences with our logistics students. The Fall 2014 Roundtable was 28 percent larger than the previous event held in Spring 2014 and the largest Logistics Roundtable to date. The Spring 2015 Logistics Roundtable event is already shaping up to be even larger, which is great news for students majoring in or interested in logistics. The logistics faculty members are excited to continually partner with new companies to improve the curriculum and provide new career opportunities for Georgia Southern logistics students. “This was unquestionably the best organized and well executed roundtable we have participated in,” said Chris Boone, assistant professor of logistics and one of the organizers of the event. Questions about the event can be directed to Drs. Chris Boone (caboone@georgiasouthern.edu), Ben Skipper (jskipper@georgiasouthern.edu), or Monique Murfield (mlmurfield@georgiasouthern.edu). On Wednesday, October 29, the Georgia Southern University Office of Career Services hosted the fall Eagle Expo Career Fair. During the event, more than 90 employers from government, retail, logistics, sales, manufacturing, and other industries recruited students for jobs, internships, and co-op opportunities. A few notable employers recruiting at the Eagle Expo included AT&T, Belk, Gulfstream, and Target. Following the career fair, many recruiters stayed on campus to speak to student organizations about their companies as well as to interview some of the promising candidates they met during the event. Dr. Mike McDonald, along with Mrs. Cindy Glover and Mrs. Carolyn Price will retire from the Georgia Southern University College of Business in December. J. Michael McDonald, PhD, is currently the Dixie Crystals Professor of Business and has taught at the University for 28 years. The Dixie Crystals Chair was endowed by Savannah Foods and Industries, and Mike was selected for the chair position by the executive team of Savannah Foods, headed by William Sprague, Jr., CEO. Throughout his career, Mike emphasized classroom teaching as his top priority. Prior to accepting the Dixie Crystal Chair position in 1988, he was at Clemson University. In 1987, Dr. McDonald was awarded the Alumni Master Teacher Award at Clemson. In 1990, he was voted Professor of the Year by Georgia Southern students. He has since received the 1992 College of Business Outstanding Teaching Award and the 1993 University Excellence Award for Teaching. Mike directed the Office of Graduate Studies in the College of Business for 13 years. In that role, he helped develop the Georgia WebMBA®, which is now a nationally ranked degree program. He received his BS in industrial management from the Georgia Institute of Technology, MEd in counseling psychology, and PhD in management from The University of Georgia. He has published numerous articles in management journals and consulted widely with companies throughout North America, England, Ireland, Puerto Rico, New Zealand, and Australia. Mike is married to Bonny, and they have two sons and two grandsons. In retirement, he hopes to stay active with Georgia Southern, while he enjoys living between Statesboro, St. Simons Island, and Portland, Oregon. Mrs. Cindy Glover started working at Georgia Southern University in December 1989 in the Alumni/Foundation Office. Then, in January 1991, she transitioned to the College of Business as the secretary to the dean, Carl Gooding. In 2006, Cindy worked in the MBA office with Dr. Mike McDonald and has since returned to the dean’s office, working for the assistant dean, Mrs. Cindy Randall. Mrs. Carolyn Price started with the College of Business in October 1995 as an administrative assistant in the associate dean’s office and transferred to the dean’s office as administrative assistant in July 2006. She received the StAR award in 2008 and the Tomlinson & Bond Families Staff Award for Excellence in 1998 and 2014. The College of Business would like to thank these three individuals for their time, dedication, and service to the College. We wish you the best in your retirement. On Thursday, October 30, the Dean’s Advisory Board and the Young Alumni Board met to discuss the business of the College. During the Dean’s Advisory Board meeting, members discussed initiatives for the College along with future plans, setting the date for the spring board meeting in Atlanta on April 30 – May 1. This first time meeting of the Young Alumni Board proved to be very productive as the group of about 30 young alumni discussed and approved its bylaws. After an afternoon of meetings, the College of Business sponsored a tailgate for the boards, featuring a low country boil provided by The Boiling Shrimp in Statesboro. The two boards networked and helped cheer on the Eagles football team to a 42–10 win against Troy University. Phil Calandra is the co-founder and CEO of Calandra Financial Group, LLC, and Calandra Wealth Management. Before creating his independent wealth management firm, Phil spent more than 20 years consulting with such Fortune 500 companies as Coca-Cola, Walt Disney World, UPS, and Georgia-Pacific. Along with his wife and business partner, Jennifer, he now advises clients on issues of crucial importance so they can make the financial decisions needed to retire with peace of mind. Phil is a registered financial consultant (RFC) and an investment advisor representative. Phil is also the chief investment strategist at Calandra Financial Group, LLC, and a nationally recognized expert in retirement income planning and investment management. Phil and his firm have received multi-year awards as a Five Star Wealth Manager and “Best of Atlanta” in financial planning. Phil is also honored to have received the highest award the State of Kentucky can bestow, The Kentucky Colonel, and is an American Legion Civic Leadership Award recipient. Phil has written extensively for the financial press. His second book, Retirement Unchained: Break Free from Wall Street and a Government Gone Wild! released in 2013, and he recently released his third best-selling book, SuccessOnomics co-authored with Steve Forbes. Phil has appeared on ABC, NBC, CBS, and FOX affiliates around the country and has been cited in articles in a variety of print media and websites including USA TODAY, Fortune, Forbes, Newsweek, and The Wall Street Journal. Phil has been heard on Metro Atlanta radio and currently co-hosts “Financial Straight Talk” with “Consumer Investigator,” Dale Cardwell. Together, they will host a TV show designed to protect consumers and help them build wealth beginning in January 2015. A native of the Atlanta area, Phil currently resides in Kennesaw, Georgia, with his wife and business partner, Jennifer, and their four sons. Phil is an active member of Burnt Hickory Baptist Church and enjoys reading, playing trumpet, skiing, and riding his Harley-Davidson motorcycle. Management faculty in the College of Business represented Georgia Southern University at the 2014 Southern Management Association (SMA) conference November 11–15 in Savannah, Georgia. Drs. Mikelle Calhoun, Steve Charlier, Misty Loughry, Joseph Rousseau, Mary Beth Rousseau, and Steve Stewart were on hand to welcome participants to the conference kick-off reception hosted by the Georgia Southern University College of Business. Dr. Misty Loughry introduced conference participants to best practices in managing student teams through the CATME web-based tool developed by her team of researchers. CATME is used by more than 6,000 faculty and 300,000 students across 59 countries to manage and assess student teams. 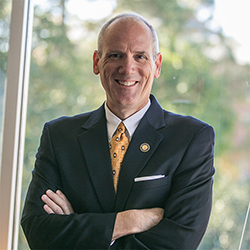 Allen C. Amason, dean of the College of Business, has been involved in the SMA for his entire career. He has served on the board in numerous officer positions and was SMA president in 2008. Dr. Amason was a presenter and panelist in several key events at this year’s conference. Southern Management Association is an affiliate of the 17,000-member strong international Academy of Management. SMA membership includes more than 1,000 professors, doctoral students, and executives representing 200 colleges, universities, and businesses. While concentrated in the Southern United States, the membership hails from 43 states and several foreign countries. SMA publishes the highly respected Journal of Management, arguably one of the top five academic journals in its field. The OneGeorgia Authority, a financial partner for economic development in Georgia, has announced its decision to grant a $500,000 OneGeorgia Equity Award for the advancement of workforce development in the Statesboro-Bulloch County region. The project, titled “Statesboro-Bulloch Regional Career and Workforce Initiative,” is a collaboration among Georgia Southern University, the Development Authority of Bulloch County, and Ogeechee Technical College. The grant will assist with the purchase of equipment, software, and machinery necessary to support economic growth and a work-ready labor force, leveraging the expertise of Georgia Southern University and Ogeechee Technical College by supporting business startups and workforce training. Funding received from the OneGeorgia Authority Equity Fund will be used with other funds provided by Georgia Southern to secure computers, software, 3-D printers, and other rapid prototyping equipment for the Innovation Incubator and Fabrication Laboratory (FabLab). The Innovation Incubator and FabLab is a joint venture between Georgia Southern University, the Downtown Statesboro Development Authority, City of Statesboro, Statesboro Arts Council, and the Economic Development Administration and is associated with the Massachusetts Institute of Technology-established Global FabLab Network. The incubator is designed to create sustainable jobs, increase the number of local businesses, and improve and diversify the economic drivers in coastal Georgia. On Thursday, November 6, Dr. R. Glenn Hubbard visited the College of Business and the Department of Finance & Economics. While visiting, he met with students and faculty to discuss a variety of topics in economics and finance with the discussions being filmed. These “film clips” will be used in teaching Economics 2105 in the spring, in conjunction with the use of Dr. Hubbard’s book. In addition, Dr. Hubbard spoke and answered questions to a large audience of students, faculty, and a few members of the Statesboro business community. He talked about his recently published book, Balance: The Economics of Great Powers from Ancient Rome to Modern America, along with lessons learned from economics history to help us understand the current U.S. economy going forward. On Friday, November 7, the Department of Management in the College of Business Administration co-hosted “Raise the Woof,” a fundraiser for the Humane Society of Statesboro and Bulloch County. The event was held in the Russell Student Union ballroom. “Raise the Woof” was a comedy night-club and cabaret experience for students and members of the community. The event was planned, organized, and managed by students in the hospitality management program in the College of Business. Two classes and a student organization, the Georgia Southern Hospitality Club, worked together over the course of the semester to design, organize, and execute the event from beginning to end. The course, promotions in the hospitality industry, provided student management teams the opportunity to design the event and its execution, including sales, marketing, decoration, and community outreach. Another course, hospitality industry management, provided logistics and marketing support as well as staff members for service, including cashiers, servers, and food preparers. Students in both of these courses worked with volunteers in the Hospitality Club to create a student-led, experiential and educational experience outside of the classroom. Dr. Stan Suboleski, assistant professor of management, brought these students together to work with Kania Greer, president of the local chapter of the Humane Society, which benefitted from the fundraising efforts. The evening included cocktails and hors d’oeuvres provided by students, a three-act stand-up comedy show, raffles, information on the humane society, and, of course, funny pet videos from the internet that have gone viral. All beer, wine, and a majority of party supplies were donated by local liquor distributor, United Distributors. The University donated professional labor from the conference services and catering departments in Eagle Dining Services in support of the function. Georgia Southern also made space available for prep, setup, and execution of the event. Local area restaurant vendors generously donated the food to serve guests of the show, including Ocean Galley Seafood, Southern Boys BBQ, LongHorn Steakhouse, Panera Bread, Ruby Tuesday’s, and Wild Wing Café. The managers/owners of Ocean Galley, Adam Burgamy, and Southern Boys BBQ, Stephen Maenpaa, both recent graduates and alumni of the Hospitality Management program, provided culinary instruction and interaction on-site during the function, with the goal being a real time simulation of work experiences for the students. The function was a grand success, serving more than one hundred guests and raising several thousand dollars in profit for the Humane Society of Statesboro & Bulloch County. The event will likely become an annual event. Georgia Southern running back Matt Breida was added to the list of candidates for the 2014 Doak Walker Award. The prestigious national honor, named for Heisman Trophy winner and three-time All-American Doak Walker, was created in 1989 to recognize the nation’s premier running back for his accomplishments on the field, achievement in the classroom, and citizenship in the community. Breida, who has the best per-carry average in the nation at 9.43 yards per attempt, leads the Eagles and the Sun Belt Conference in rushing with an average of 130.4 yards per game and scoring (102 points). He has a cumulative grade point average of 3.0 and is planning on majoring in business. The sophomore from Brooksville, FL, and Nature Coast Technical High School has recorded two games with 200 or more yards rushing, with seven games with 100 or more yards on the ground. On the 2014 season, Breida has 1,434 total, good for fourth nationally and is currently ninth on the Georgia Southern single-season chart. Breida’s 16 rushing touchdowns are the most in the Sun Belt Conference and put him in a tie for seventh nationally. He has six games with multiple touchdowns and leads the nation with seven touchdowns of 50 or more yards each. Breida’s 88-yard touchdown at Navy Saturday is the third-longest rushing TD in Georgia Southern history. Doak Walker, who in addition to being a running back, punted, returned punts and kickoffs, and kicked extra points, epitomized leadership, sportsmanship, and academic and athletic achievement during his storied career at Southern Methodist University (SMU) in the late 1940s. Walker was a three-time All-American who started as a freshman at SMU. He was the first junior to receive the Heisman Trophy and won the Maxwell Trophy as a sophomore. His collegiate playing career was interrupted by a year of service in the U.S. Army. Walker later played for the Detroit Lions and led the NFL in scoring as a rookie in 1950. A 1959 inductee to the College Football Hall of Fame and member of the 1986 Pro Football Hall of Fame, he was honored to have his number 37 jersey retired by SMU prior to the 2000 season. The College of Business would like to congratulate one of its very own, J.J. Wilcox, for his first career interception in the NFL in the Washington Redskins vs. Dallas Cowboys game on Monday, October 27. Way to represent the Eagle Nation, J.J.! The Georgia Southern University College of Business would like to congratulate alum Luke Bryan (MGNT, 1999) on winning CMA Entertainer of the Year (2014) on November 5 during the CMA Awards. We would also like to congratulate Cole Swindell for being nominated 2014 CMA New Artist of the Year. Two of our College of Business PhD graduates, Dr. Stephanie Thomas and Dr. Sara Liao-Troth, along with a former colleague, Dr. Scott Webb, had their submission, “Teaching Supply Chain Management Complexities: A SCOR Model Based Classroom Simulation” selected as the 2014 Decision Sciences Journal of Innovative Education (DSJIE) Outstanding Teaching Brief. The award comes with a $1,500 prize courtesy of Wiley-Blackwell and Alpha Iota Delta and commemorative plaques. Dr. Stephanie Thomas was also selected as one of the 2014 DSJIE Outstanding Reviewer. In the October 2014 e-newsletter, we erroneously mentioned the names of the restaurants that catered the Welcome, BBA Students lunch that was held in September. The correct caterers for the luncheon that served 800 students and faculty were Georgia Southern University Catering, Barberitos, Larry’s Giant Subs, and Subway.